Understandable navigation: Don’t try to be clever here — it is easy to use traditional-sounding categories and navigation. A visitor should have no issues finding the other pages on your site, Palme says. So keep it simple and easy to understand – pages entitled “About” and “Frequently Asked Questions” have the same meaning everywhere. While creativity in page design is nice, if you place the navigation in a strange spot or display it in a confusing manner, chances are no one will know what to do on your page. In addition, don’t put too many links on the home page — it will be too confusing. A very brief overview of the site’s purpose: Think of this as an elevator pitch for your site, which briefly explains what it is all about. There shouldn’t be loads of text. That’s what the other pages on the site are for. And keep it clean-looking. Interesting visuals: Having all text on your home page will bore people. So you need some intriguing graphic elements to entice people. Whether it is photos, video or illustrations, a homepage needs some type of visual anchor that will break apart the text and capture the visitor’s interest right away. However, don’t get carried away, Palme says. Big ads and dynamic graphics will often capture your user’s attention and divert them from what they should be doing on your site. A reasonable loading time: People will leave your site quickly if it takes too long to load. So use tools to regularly check your load speed and keep up on anything that’s slowing loading time down. Compress your graphics, keep your code clean and remove any unnecessary files and plugins to keep your site loading as quickly as possible. Lisa Swan writes for a variety of SEO and web marketing sites. She is on Twitter at lisa_swan. 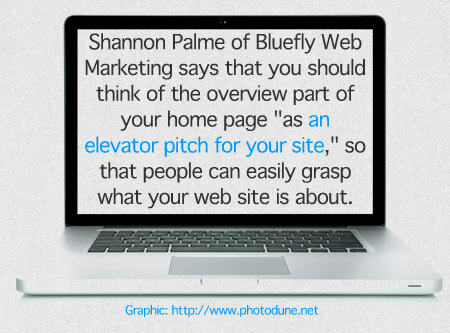 To learn more tips from Palme and Blue Fly Web Marketing, click here.